Selecting the right service to maintain your online privacy is no small thing. In our ongoing effort to help you make an informed decision, we offer a comparison between OneRep and Safe Shepherd. We are committed to helping you make the right decision for your privacy needs. Whether you’ve moved around a lot, or lived at the same address for many years, a simple Google search can reveal your past and current addresses listed on multiple websites. There’s many reasons why you may not this information exposed online, especially your telephone number. For one, it makes you an easy target for unwanted solicitors. Or perhaps you have a former alias you no longer want made public. Either way, it’s best to remove all of your personal contact information ASAP and reclaim your right to privacy. *Information on Safe Shepherd’s Service details were found on Safe Shepherd Private Dashboard, May 2017. OneRep will remove ALL previous and current addresses, ALL variations of your first and last names, and ALL of your email addresses and phone numbers. Even old information that seemingly has nothing to do with you anymore can make you vulnerable and affect your safety and reputation. Hence why it’s imperative to reclaim and maintain control of your personal data. We have to dig through all pages on Safe Shepherd website in an attempt to find information from which websites Safe Shepherd actually removes data from but we weren’t very successful so far. The only thing we managed to find was only this vague excerpt : “…we can’t remove it all, but we can remove a lot”. Really? Well, thanks for clearing that up, Safe Shepheard. “If a website doesn’t allow us to automatically remove your information, we’ll provide straightforward instructions for how to handle the exposure”. – Safe Shepherd F.A.Q. So you’ve paid for the service and have to remove private information by yourself, seriously? Let’s assume they remove automatically from the most popular sites like Spokeo, Beenverified, Nuwber but these websites do not require sending faxes, speaking with representatives of people-search websites. Safe Shepherd put the most difficult and time consuming task on your shoulders. At OneRep you will receive highly qualified assistance and guaranteed removal from 77 websites. That includes removal from Spokeo, People Finders, Nuwber, Instant CheckMate, Zaba Search and much more. If the algorithm is not able to remove records automatically our team will manually handle it by speaking to representatives of the websites on your behalf, sending faxes, passing through all opt out stages. In addition to this, you can provide links to the websites that are not in the list of sites OneRep normally removes from and the team will do its best to delete your records from that websites as well. No extra fees, everything is already included in the price of subscription. At OneRep, we believe our customers should be 100% protected at all times. Unlike Safe Shepherd, we don’t cut corners or push responsibility onto you. The buck stops here. OneRep believes value matters, while others feel there’s a connection between price and quality; in other words, you get what you pay for. In reality, the truth falls somewhere in between. Take a look at this chart comparing OneRep and Safe Shepherd’s membership plans and pricing. *Information on Safe Shepherd’s Service details were found on Safe Shepherd F.A.Q., May 2017. “Services also include 1:1 phone consultations that do come at an extra fee of $24.95. However, services also include having the luxury to email us for consultations as well, for NO fee”. We find this phrasing disconcerting “The Luxury To Email Us”. Huh? In other words, Safe Shepherd believes they’re doing you a favor by reading your emails, all for the privilege of giving them your money. On top of that, they want an exorbitant fee of $24.95 for phone consultations in addition to their subscription rates. So if you ever have an urgent question or need a consultation, you have to pay extra out of pocket. No thanks, Safe Shepherd! By comparison, OneRep provides free phone, email and chat consultations whenever you need them. Just leave your number and you’ll receive a guaranteed callback within a few hours, often immediately. We’re always ready to provide expert assistance for all your privacy-related issues. Both Safe Shepherd and OneRep offer free opt-out instructions. In this case, you don’t pay for the subscription and complete removal process by yourself. Safe Shepherd made the Internet Privacy Handbook and everyone can use it for free. There are quite a lot of instructions, however most of them are not comprehensive and difficult to follow as screenshots are not attached to them. Let’s see how one removal instruction looks like on OneRep and Safe Shepherd. As an example we took Beenverified.com, one of the most popular people-search website. Click here to learn more how our free opt-out instructions can help you to regain online privacy. All removal instructions at one place. Discover how to opt out of Whitepages, Spokeo, Intelius, and 100+ people search websites and data brokers. Your participation in the removal process OneRep team does everything for you. If they cannot remove automatically your records, you have to do it by yourself. Customer Care Free consultations (via phone, email, chat) Phone consultation for an extra fee of $24.95, via email. Does the service provides with self-removal instructions Yes (screenshots + detailed step-by-step instructions). 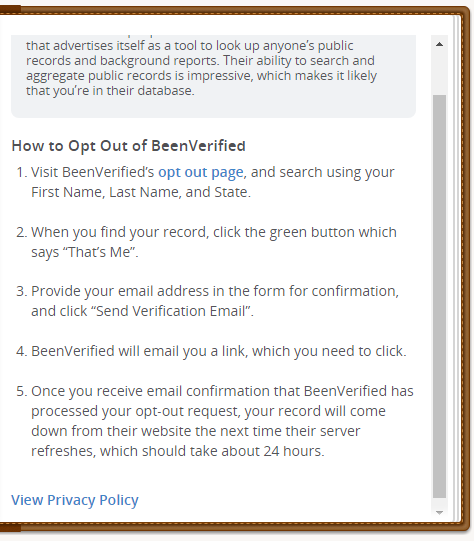 Opt-out instructions without screenshots.